At a cement facility, exhaust from the kiln contains the largest volume of particulate matter (PM). Most cement plants utilize fabric filters as their primary air pollution control device to separate particulate from the gas stream. Baghouses and dust collectors are equipped with several hundreds of filter bags. With the advent of the tighter PM regulation at the kiln, even one filter bag failure can cause the emission limit to be exceeded. Therefore, it is important to identify and replace a defective bag as quickly as possible. Manual inspection of filters and baghouse components is time consuming and can require a shutdown or extended outage. Typical opacity PM monitors and baghouse controllers are basic and do not provide intelligent control or preventive insight into the process. Innovative probe-based charge induction technology is best suited for fabric filter applications. When particles flow around the probe, small charges are induced into the probe by flowing particulate, creating a tiny current in pico amperes (pA). Digital signal processing is used to process the signal into an absolute output that is proportional to the mass of particulate. This probe-based technology provides leak detection and continuous calibrated mass (mg/cu m) outputs. Induction sensing, combined with a protected probe, enables operation with some particulate build-up and process moisture, which is also beneficial for most conductive particulate applications. 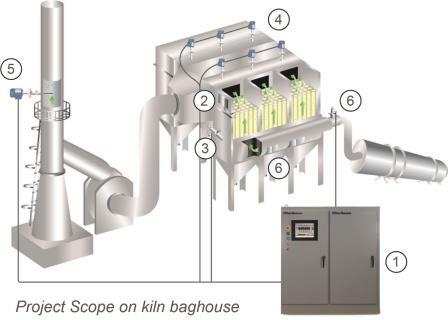 This provides operators of kiln baghouses early warnings of developing filter leaks requiring maintenance attention to prevent gross bag failures, increased emissions, and help remain in compliance. The combination of charge induction technology and integrated pulse jet cleaning and maintenance diagnostics provides total insight and control to minimize emissions and maximize cement production. This case study summarizes the improvements resulting from implementing the B-PAC integrated particulate emission monitoring and optimized pulse jet cleaning system at a cement plant located in the Midwest. This cement-producing plant utilizes three kilns, each with a wet and dry process. The dry process consists of crushing material quarried and combined with additives before it is fed into the kiln. The wet process materials are ground down with water and fed into the kiln as slurry. Kiln temperature can reach 2700ºF at the blast furnace side, which leads to high temperatures at the baghouse of up to 400º. When the material is in the kiln, there are certain elements that burn off in the form of gasses. These are the gasses eventually passed to the dust collectors. Filtration systems are a critical part of productivity and emissions control in cement manufacturing. In addition to the kiln, other baghouses include the raw mill, clinker cooler, and coal mill. There are also material handling and nuisance dust collectors. Larger baghouses are required under federal NESHAP, MACT, or state regulations for continuous monitoring, while nuisance filters often have no visible emission requirement. The cement producer was challenged to meet EPA regulations without interrupting production, while striving to improve profitability in a competitive cement market. Typical sensors and controls for baghouses are often basic and do not provide intelligent control or preventive insight into the process. Time-consuming manual inspection of filters and baghouse components becomes necessary. This can require a shutdown or extend an outage. The historical EPA requirement for an opacity monitor in the stack provides little value toward preventive and proactive emissions control. While striving to improve operations and meet US-EPA NESHAP requirements for particulate emissions, the cement plant researched solutions to implement during the upgrade of three kiln baghouses. The plant manager wanted a top-level team for the project, and turned to FilterSense. To fully monitor and further optimize the kiln filtration systems and overall plant production, the cement plant purchased three B-PACs with a full array of process sensors, integrated particulate monitors, and ancillary control electronics. 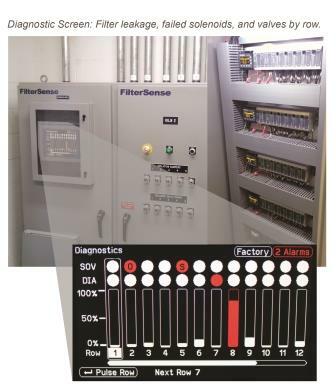 FilterSense’s FilterWARE software was purchased for local HMI, while the B-PACs also provided Ethernet IP to an IFix SCADA system. FilterSense also provided full support, including electrical engineering design and documentation, on-site installation review, product commissioning, and training. B-PACs feature tightly integrated sensing and control, providing intelligent differential pressure control, optimized filtration and pulse cleaning, actionable diagnostics, and advanced DynaCHARGE particulate monitoring, which utilizes charge induction sensing. Using the local FilterWARE HMI, operators can easily view process variables, diagnostics, total particulate emissions, filter leaks by row, pulse rates, and energy use. Pressure and cleaning settings and damper controls are readily available for easy adjustment. The solution provides total insight and control to minimize emissions and maximize production. In addition to EPA regulations, there are process and maintenance benefits from FilterSense solutions. For example, B-PACs can help address concerns with coal mill fires by avoiding coal dust buildup in the clean air plenum or coal buildup between filters. Basic DynaCHARGE leak detectors can replace manual inspections of small dust collectors and individual compartments. All FilterSense products can be networked to a central FilterWARE HMI/SCADA and reporting solution. The NESHAP regulations on particulate emissions, as set out by the US Environmental Protection Agency (EPA), have encouraged domestic cement producers to upgrade their baghouses’ control systems. Thanks to its baghouse control upgrade, this cement producing facility has benefitted from improved baghouse performance as plant staff can now prevent, rather than react to, filter operation issues. Vahid Mirsaiidi, P.E., is manager of sales and technical support, FilterSense, Beverly, MA. FilterSense provides particulate monitoring and control solutions in fabric filter applications. For more information, call 978-927-4304 or visit www.filtersense.com.